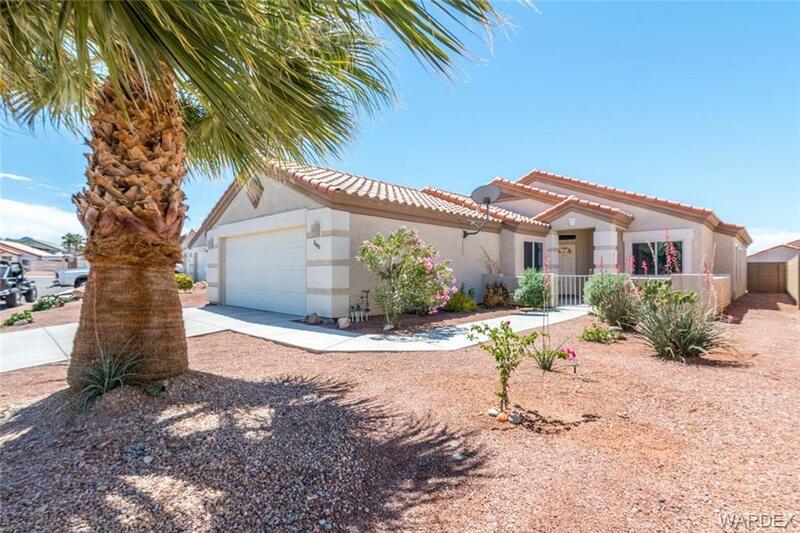 Welcome Home to The Prestigious "Wingate at Fox Creek", Neighborhood, (Open to all Ages) Located on the Bullhead City Parkway, Nestled on a Quiet cul-de-sac. Beautiful Mature Landscaping Greets you in the Front and Backyards. This Spacious Home has 1650 sq. ft. with a Large, Open Floor Plan. Includes 2 Bedrooms and Den with Double Doors. Large Breakfast Bar & Dining Area, Gas Stove, Electric & Gas Hook-ups for Dryer and more. All Windows have Window Coverings. Ceiling Fans are included throughout the Home. Charming gated Front Courtyard and Covered Patio in the Backyard are Ready for Your Enjoyment!! The Backyard is "FULLY Fenced" with a Custom New Block Wall!! Your HOA's include access to the Clubhouse, Pool and BBQ (ready for you to Grill). Additional RV, Boat Parking is also available. Conveniently Located Close to Shopping, Hospitals, Colorado River and Laughlin Fun!! Come Call This "Your Home". © 2019 Western Arizona Realtor Data Exchange All rights reserved. Information deemed to be reliable but not guaranteed. The data relating to real estate for sale on this website comes in part from the Broker Reciprocity Program. Real estate listings held by brokerage firms other than River City Realty are marked with the BR logo and detailed information about them includes the name of the listing brokers. Listing broker has attempted to offer accurate data, but buyers are advised to confirm all items. Information last updated on 2019-04-21.